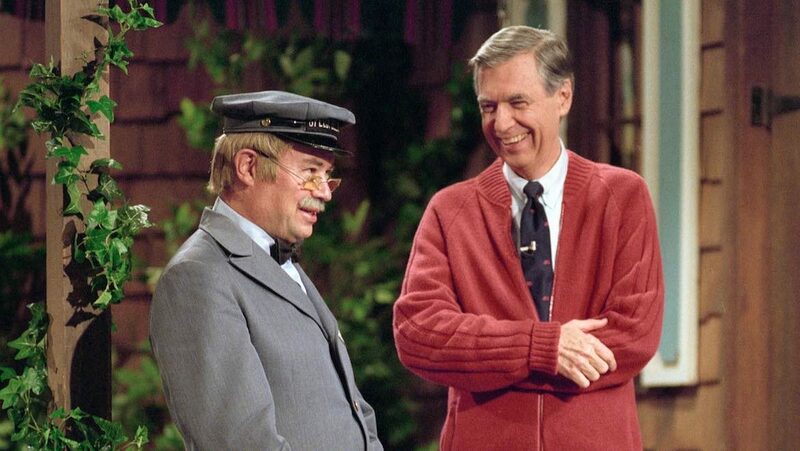 David Newell as Speedy Delivery's Mr. McFeely and Fred Rogers stand on the front porch set while filming an episode of "Mister Rogers' Neighborhood." 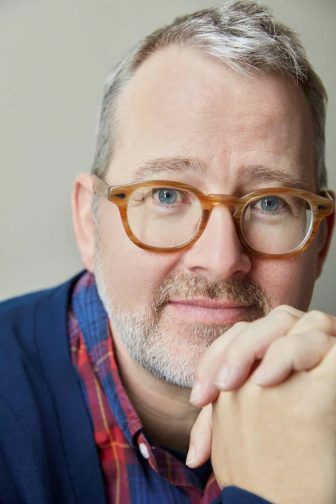 When Morgan Neville, an Oscar-winning documentary filmmaker, decided to turn his lens on Fred Rogers and his Neighborhood of Make-Believe, he pitched a specific idea to the family of the beloved children’s entertainer. The story Neville tells in Won’t You Be My Neighbor? — a documentary that premiered to critical acclaim at this year’s Sundance Film Festival and goes into national theatrical release June 8 — is anything but boring. The title comes from the song that opened each of the 895 episodes of Mister Rogers’ Neighborhood that aired on public television, and it reflects the philosophy of compassion and kindness that was central to Fred Rogers’ life and work. This year marks the 50th anniversary of when Mister Rogers’ Neighborhood moved from a regional program for children to one with a nationwide audience. Considerable attention is being paid to its host and creator. So far this year the U.S. Postal Service issued a stamp in Rogers’ honor and PBS aired an anniversary special. An extensive biography, titled The Good Neighbor: The Life and Work of Fred Rogers, is due out Sept. 4. Tom Hanks has signed on to portray Rogers in a biographical movie called You Are My Friend, directed by Marielle Heller. Filming begins this fall; no release date has been announced. And in early 2019, PBS’s Independent Lens will present the national broadcast premiere of Won’t You Be My Neighbor? PBS Programming VP Bill Gardiner announced the debut and presented a sizzle reel during an April 5 luncheon at PBS TechCon. A PBS spokesperson later said the film’s Independent Lens premiere is not yet final. When Rogers died in 2003 at age 74, he had received countless awards and accolades, including the Presidential Medal of Freedom, induction into the Television Hall of Fame and a Lifetime Achievement Award from the Daytime Emmys. His legacy isn’t about red carpet; it is concerned with nurturing the emotional lives of generations of young children. 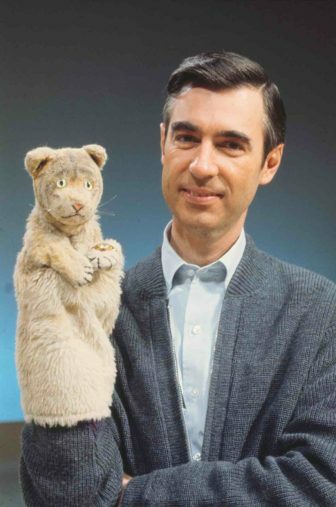 Rogers’ career as a television performer began off-camera, bringing to life such now-familiar puppets as King Friday XIII and Daniel Striped Tiger, created for The Children’s Corner, a show aired by Pittsburgh’s WQED from 1953–61. He finally took center stage on MisteRogers, a CBC show for children that launched in 1961. Rogers returned to WQED in 1966 to produce Mister Rogers Neighborhood. The show was distributed to other public TV stations through the Eastern Educational Network and eventually became a signature children’s program of PBS. Production of new episodes continued until 2001. In the history of television, no host of a children’s programs proved to be so industrious. Rogers served as performer, writer, songwriter, singer, puppeteer. A pioneer in educational television as well as an ordained minister, Rogers cared deeply about the social and emotional development of children. He did his best to assure them that it was OK to feel mad, sad or any other emotion. Rogers directly addressed concerns children might have and espoused the idea of treating everyone with kindness. Rogers’ idea, which was unique for the times, was to speak honestly to children to help them process what was bothering them. After taping his last program, Rogers returned to the studio after the 9/11 terrorist attacks to make a public service announcement reassuring children. “Up until this day, it’s hard to imagine somebody else talking to 3-year-olds about terrorism or assassination,” Neville said. Won’t You Be My Neighbor? uses interviews, archival footage and animation to unspool its story and offer insights into why Rogers was so empathetic and so imaginative. A chubby child, he was tormented and teased by his peers, who called him “Fat Freddy.” A sickly child who fell ill with “every imaginable childhood disease — even scarlet fever,” as Rogers says in the film, he spent his time in quarantine making up games to play. “Fred always said the outer child may change but the inner child doesn’t,” said Newell, who is beginning work on a book about the program. While it may feel as though Mister Rogers Neighborhood “is sadly anachronistic” today, Neville said, his goal in making the film was to bring Fred Rogers’ voice back into the public consciousness. For years Neville had felt that too many people in the public sphere have been operating out of their own self-interests and not for the long-term good of the community, he said. Neville sought to address this as he got deeper into the research for Won’t You Be My Neighbor? Editor’s note: This article been updated with PBS’s clarification that plans for the film’s Independent Lens premiere are not yet finalized. Fred Rogers occupied a quiet corner of the tumultuous television landscape, but his influence was profound and borne of the kindness, love and honesty he inspired in people.